Baked Macaroni Double Cheese, a delicious and creamy oven baked Cheddar and Parmesan Cheese baked Pasta Dish. The Perfect Weekday or Weekend meal. 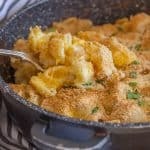 Baked Macaroni Double Cheese is the perfect comfort dish, fast and easy and made and baked in one skillet. I shared my news of the departure of my eldest daughter back to Toronto in my last post, and yes today is the day. (sad face). We have been trying to pack in lots and lots of visits with family and friends these last few days, and to tell the truth maybe I have been lifting the fork more than normal trying to feed my sorrows. And feed them I did with this Homemade Baked Macaroni Double Cheese. Ever since I discovered cheddar cheese at the grocery store I knew I had to find a way to combine my two favourite cheeses into one dish. Cheddar and Parmesan cheese. This, my friends is a good one! I will not apologize for the fact that I was (maybe still am) a lover of a certain boxed macaroni and cheese mix in Canada. But I have to say this homemade Baked Macaroni is on a whole new level. I decided to use a bigger elbow macaroni this time. And make sure you cook the pasta with a little bit of an extra al dente, because it will cook more while baking. 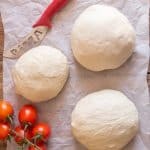 More Baked Pasta Recipes you may enjoy! In a medium oven proof skillet I made the creamy white sauce, and then I added the cheese, I let the cheese almost completely melt, then I gently mixed in the pasta. I sprinkled on the bread crumb and parmesan mixture which gave it the perfect crunchy topping! This topping is perfect for baked pasta dishes. This Homemade Baked Macaroni Double Cheese is a dish that the Italian eats without uttering a peep, so that goes to show just how good it is! Buon Appetito! 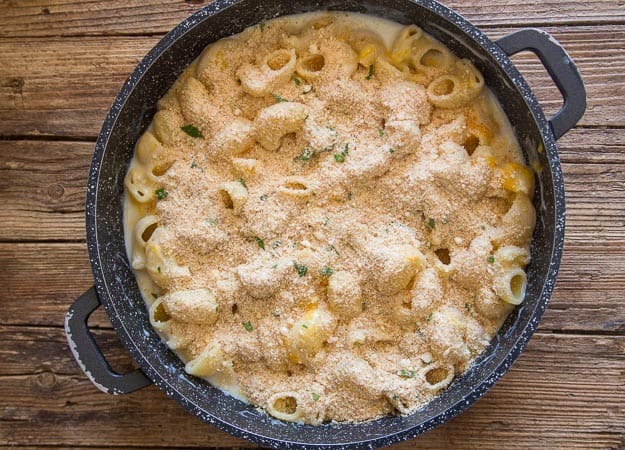 A fast, easy and Creamy Double Cheese Macaroni Dish. Pre-heat oven to 400° (200° celsius). 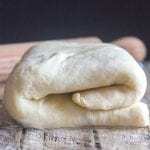 Grease well a medium-sized baking pan 10 x 8 inches (26 x 20 centimeters) or use an oven safe skillet. In a small bowl mix together bread crumbs,1 1/2 tablespoons Parmesan cheese and chopped parsley, set aside. In a large pot over low-medium heat, melt butter, add flour and salt, whisk well together, then add mustard and milk, whisk until smooth and thickened (once mixture comes to a low boil, cooke 20 seconds) then add cheddar and Parmesan cheese, stir until almost completely melted, add macaroni and gently stir to combine, pour into prepared baking pan, top with cracker crumb mixture, bake until browned, approximately 25 minutes. Let sit 3-5 minutes before serving. Enjoy! Republished from August 26, 2015. 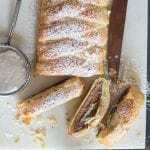 This recipe is neatly identical to my recipe with two exceptions. I use Dijon mustard rather than yellow mustard and add about a teaspoon on onion powder. It’s a great recipe no matter how you make it. Hi Cassie, thanks so much and yes Dijon would give it a delicious taste. Have a great Sunday. 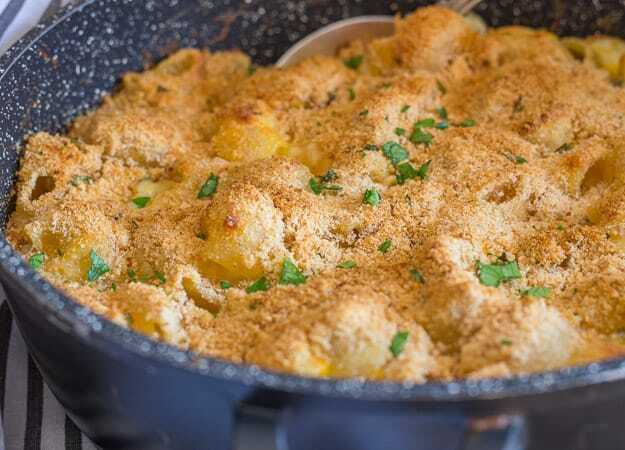 This looks super creamy and perfect for dinner on a cool evening! Thanks Johnna it really is. Love the cracker crumbs on top! Great idea! Thanks Lauren, my Mom always liked putting on cracker crumbs. 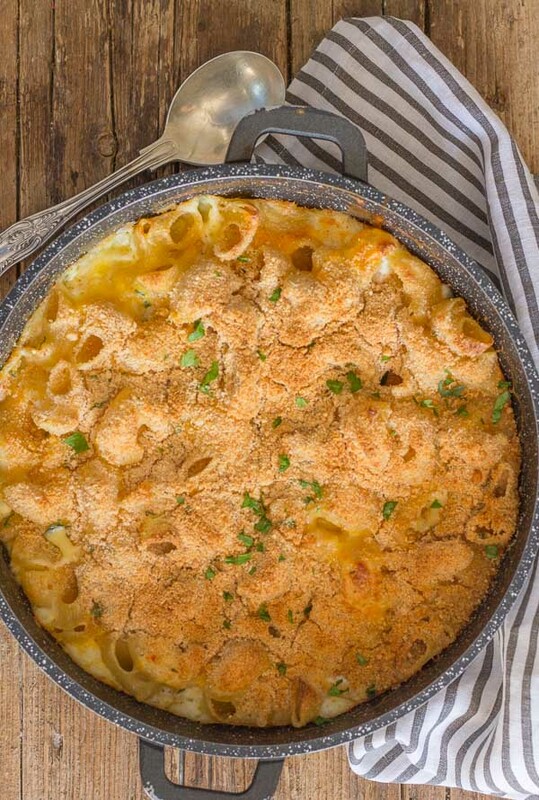 I adore mac ‘n cheese and this one looks spectacular. I won’t turn on the oven just yet – temps are hovering around 100 degrees F here, but as soon as we get a few cool days in a row, I’m heading right back to this recipe. Oh my gosh Laura, still so hot! Here in Toronto too. Hope you enjoy it. Looking forward to the cool air! Do you buy the cheese from the deli cheese area or the bagged shredded cheese? Thanks Claudia hope you enjoy it. Have a great Sunday. I, too, really like boxed mac & cheese but this looks like a great alternative! Hi Emily, thanks and yes it is a delicious alternative. Hi Allie, haha and he does! Have a great weekend. do you think this could be made earlier in the day and then baked at dinner time to reduce prep time ? Hi Nicole, I think it would work, just keep it in the fridge until approximately 20 minutes before baking, but don’t put the topping on it until just before you bake it. Have a wonderful Christmas. It’s that time of year to bring out those hearty comfort food recipes…please consider sharing this recipe at this week’s Our Simple Homestead Blog Hop, I think some of my readers would love it as well! HI Tracy thanks, and posted! 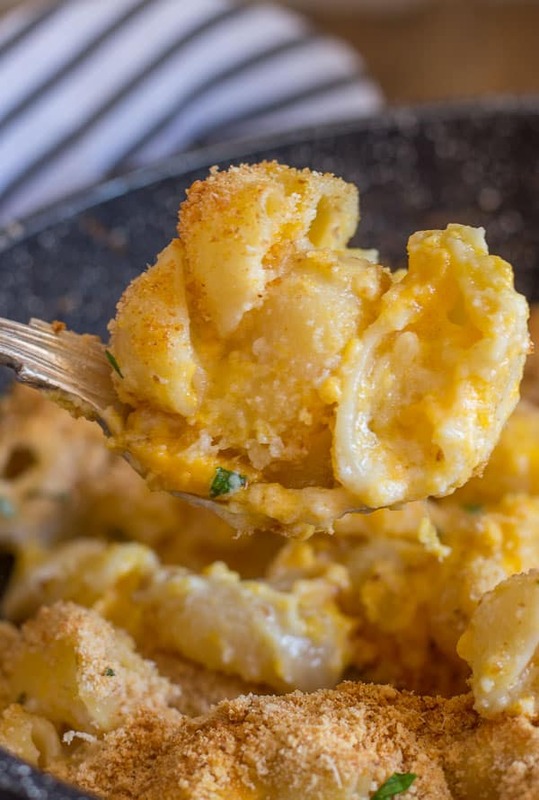 We love mac and cheese, so this may become our new favorite. Stopping by from The Creative Exchange! Where does the mustard go? Hi Ammar, sorry about that goes in with the flour. Thanks! This looks like a perfect, crave-worthy comfort food. Thank you nothing like comfort food. 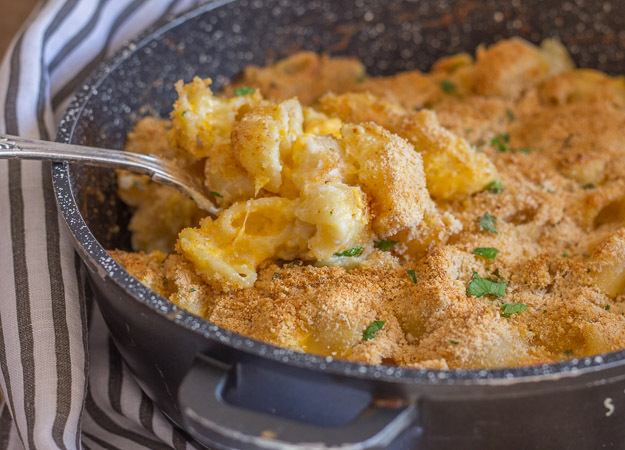 Mac and cheese is one of my all time favorite things to make once the weather cools down (and really any other time of the year…) so I’ll definitely be making this soon! Nothing is better than creamy cheese and awesome breaded topping! Hi Ariel, thank you, let me know how you like it. Yum! Would you believe I had mac and cheese on the brain today? 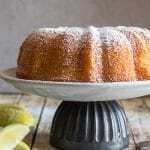 Yours looks wonderful and the perfect comfort food! Hi Carol, thanks very much, love mac and cheese. Rosemary, what a great idea to add the parmesan to this dish. You can’t go wrong with double cheese. Have a nice day. Hi Ann, thanks, I can’t get enough of Parmesan Cheese. Thanks you too! Yummy! Why is it our comfort is delicious foods of our youth! For some reason we may be drowning in sorrow but the food helps us through it. It will get better and your recipe looks outstanding. Thank you for sharing!! Hi Marisa, comfort food and chocolate, great for getting you through the tough times.